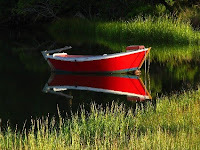 Cape Cod Solitude was accepted into the juried group art exhibit, Red: It's more than a color. The exhibition features many artists and runs from November 10, 2009 through January 14, 2010 in the Kathryn Schultz gallery and University Place gallery. The Kathryn Schultz gallery is located at 25 Lowell St. in Cambridge, MA 02138 and is open to the public Tuesday through Saturday, 11am to 5pm. University Place gallery is only a block away at 124 Mt. 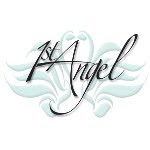 Auburn St. in Cambridge, MA 02138 and is open Monday through Friday from 9am to 6pm and Saturday 9am to 1pm. The 2009 Fall foliage season is now winding down here in the Boston area of New England and as every year has provided us with lots of black and white photo or color photos opportunities. Shooting Fall colors is an event I look forward to all year. This year was no different and I made mostly local trips but also finally got to experience Acadia National Park. 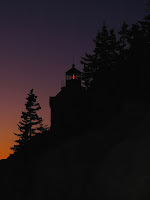 All year I plan and look for Fall destinations and locations. 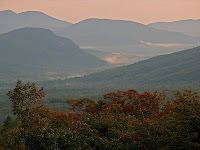 I look forward to the first foliage report from the New England Fall Foliage network at New England Fall Foliage Network. 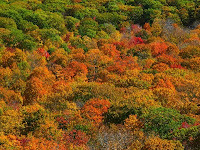 The foliage network is my major source for finding beautiful Fall colors in New England. Every Wednesday and Saturday the network provides updates on color and leaf drops throughout the region. Usually I try to time my trips when the map shows high color. I found that best colors have already passed when peak is indicated on the maps. 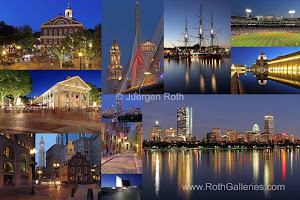 Prior to my trips I look into where and what I am going to shoot. Local destinations like the Arnold Arboretum or State Parks within an hour of Boston are preferred when there is only limited time. 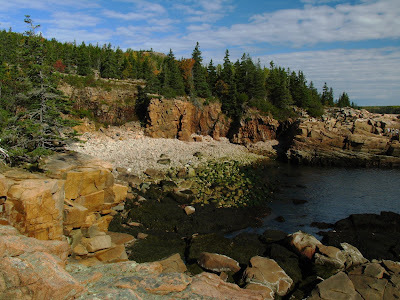 Longer photo trips are dedicated to Acadia National Park, The Whites, Green Mountains or Cape Cod. Often I find myself browsing the local bookstore or the net to find information about new locations and photo objects. The AMC hiking guides come in handy when I decide to just take off for a hike into the woods or the mountains. Although a pain to carry along, a tripod is a must. 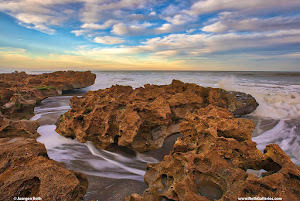 Filters like the polarizer or neutral density filters are indispensable for achieving stunning imagery. 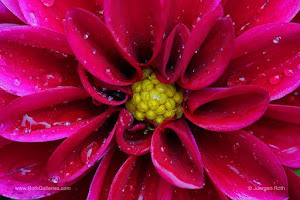 Cloudy, overcast mid-mornings provide optimal shooting conditions with minimal wind and good light. 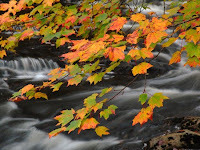 This is the time to get up close near brooks or creeks to photograph Fall colored leaves, rushing brooks or Fall foliage landscapes. The overcast sky does not add to the compositions and is eliminated from the frame. 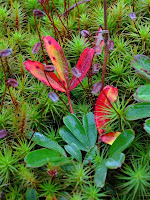 Wet vegetation in combination with the polarizer provide me with highest color saturation. I am always on the lookout to combine warm Fall hues with their complementary colors like red with green or yellow with blue. 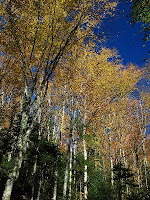 Photographing Fall colors on bright sunny days adds additional depth to images when including a blue sky in the compositions. The sunlight really makes the colors pop. 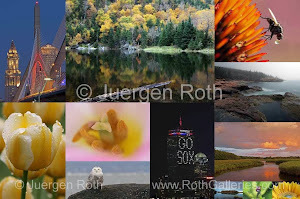 Artistic approaches for autumn photos include foliage in motion for example, solid trunks with leaves moving in the wind, fallen leaves against a milky, rushing brook or a batch of patterned color from atop a hill. Sabbaday Brook is another photograph that I am often suspected of having staged. As discussed with Spiral Rose in an earlier post this is what nature provided me and I was lucky enough to stumble across this incredible setting that day. Call it being in the right place at the right time. 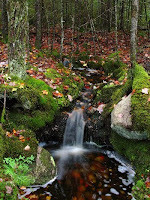 The photograph was taken on the way back from the Sabbaday Falls in the White Mountains of New Hampshire. The falls turned out to be quite a disappointment or maybe I simply was not inspired to produce something beautiful. On the way back I focused on the the rocks and stream instead and while walking downstream I discovered the setting. I composed the image so that the leaf leads into the photograph and keeps you right there. In order to do so I had to manoveur my tripod set up on other rocks and partly in the brook itself. I balanced myself from the edge of the stream to zoom in and managed to set up my camera including the self timer to limit camera shaking and picture blurryness. 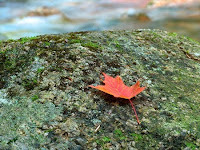 Besides the rock and the leaf, the photograph shows Sabbaday brook in the background. 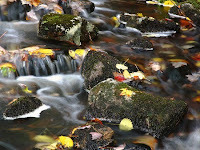 The moving stream provides a perfect border and keeps the viewers interest within the photo.